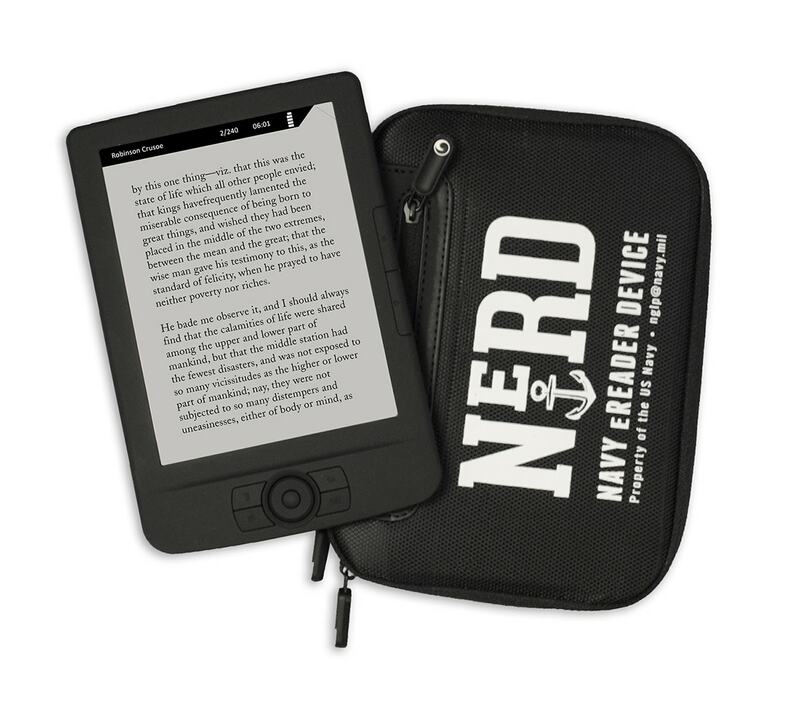 Remember the NeRD, that peculiarly locked down ebook reader developed for the US Navy? The US Air Force is interested in buying some. Earlier this month the Air Force solicited information on suppliers who could provide a new type of device. They're not taking bids just yet, but they are seeking information on companies that can provide hardware that meets a special set of requirements. The proposed device will need to have a 6" screen with a touchscreen and a resolution of 600 x 800. It will need to be readable in low-light conditions, have a battery life of at least 5 hours, and most importantly it can't have Wifi or internet access, nor any way to enter personal info. A secure non-web based e-reader – customers cannot access operating system, make changes, delete or add titles; provides access to 200 pre-loaded e-books; titles are from a variety of sources such as New York Times best seller lists, large publishers, and small or university presses; electronic collections provide access to a broad, diverse recreational and educational reading materials. I don't know of any other device that meets those standards. Sure, it's possible that another device maker could modify an existing consumer model to fit the requirements, and it is even possible for Amazon to offer a suitably modified Kindle Paperwhite (if Amazon started with the demo mode used in stores it might not take too much work). But right now the NeRD, or its civilian equivalent (Lock), is the best bet. The NeRD was designed to be used in nuclear submarines and other secure environments. It sports a 6" screen with the appropriate amount of storage. Aside from the lack of a touchscreen and a light, it meets all of the technical requirements. I would say that odds are good that the Lock, or whatever the new device ends up being called, will be what the Air Force ends up buying. And if not the Lock, the Air Force will probably still buy a device made by Findaway World. This company got its start in distributing audiobook players called Playaway to libraries. Each Playaway contains a single audiobook, and is intended to be checked out to library patrons. From the image it looks like the NeRD is running some form of Trekstor Pyrus firmware, for what that’s worth. Actually, the hardware probably came from Trekstor’s partner, Gajah, which modified it to suit Findaway World. I can understand the need for security … but it seems like such a waste of money. Anyway, the manufacturer will fill the same order over and over every couple of years, because that’s how much the batteries will last and still be called mobile.